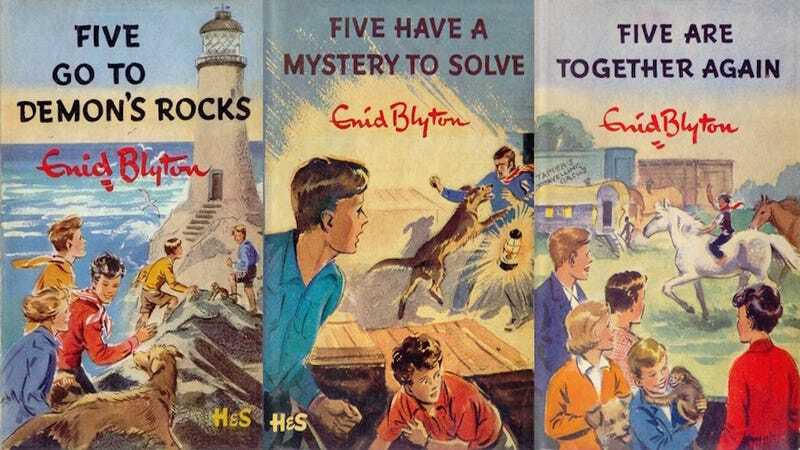 Anyone who’s enjoyed the work of Enid Blyton is familiar with the Famous Five, a group of children who have fantastic adventures when they’re home from boarding school. Now, for the first time, the identities of the children on the covers have been revealed. The biggest shocker? One of the five didn’t exist. The Telegraph reports that Mary Gernat, who illustrated the books, actually used her own four children as her inspiration for her memorable (and nostalgia-inducing) covers. Where did the fifth kid come from? The same place as all the cool things the children were doing: her imagination. Gernat’s son Roger How tells The Telegraph that his mother would ask the boys to freeze as if they were in exciting and adventurous positions (throwing rocks, pulling rope, etc.) and then sketch them out quickly. No props necessary. How’s revealing this information after a customer visiting his framing shop made the discovery of many of Gernat’s drawings in a box full of books with notes all over them. Knowing that the public would be interested, How, now 58, brought the pictures out of hiding to share with others. Probably the most interesting thing about this (besides the fact that there were only four kids) (what are you going to tell me next, that The Boxcar Children weren’t actually modeled on anyone??) is the fact that How recalls how happy the kids were to do this and the fact that Gernat paid her models, even at such a young age. “She worked very quickly so we never had to pose for long and she would give us a penny or a halfpenny as pocket money,” How Said. If you haven’t had a chance to read the Famous Five series (over 20 books!) I highly recommend you do so. And while Blyton’s most famous for this series and Noddy (adorable/terrifying), I’m hoping the next discovery will be about The Naughtiest Girl in School, easily the author’s best work.